The low-profile E6 provides natural sound with exceptional isolation from noise and feedback. 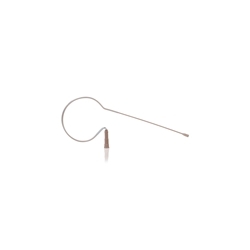 -Countryman earsets are the smallest, lightest, and least visible head-worn microphones. -The E6 detachable connector makes cable or transmitter changes easy. - The E6 earset's stainless steel, boom is incredible tough and can be bent and re-bent many times to fit different performers. The E6 is highly resistant to makeup, sweat and moisture when used with the supplied protective caps. The aramid-reinforced cable and braided RF shielding are ready for years of service in demanding environments. -With a weight of .07 oz the E6 earset is as light as it gets! You'll forget it's even there.